STAMPtember featuring Winnie & Walter! Welcome to another collaboration STAMPtember post. Featuring Winnie & Walter stamp set called The Big Bloom. Love the big beautiful flower which is great for colouring, layering, paper piecing….. You can do so many techniques with it and will make a big impact. Love the different flower centres. Lovely stamp set and dies. As part of Winnie & Walter design team, I have a project to share with you using this beautiful stamp set. I love the flower so much that I wanted to make it the highlight of the card. So I white heat embossed it on watercolour paper and watercoloured it with pink and orange colours to make the flowers bright and beautiful. I also heat embossed the leaves and water coloured them with two shades of green. For the flower centre, I chose to use the sentiment Merci so I don’t have to stamp a sentiment and take away the focal point which is the flower. I hand cut out the flowers and leaves, layered the flowers. For the background, I used Rectangled Creative Screening from Winnie & Walter, sponged Gathered Twigs and Vintage Photo distress inks on a white cardstock panel. Spattered some Picked Raspberry distress ink. I layered this panel over a strip of wooden panel pattern paper over the card front. I then adhered the flowers and leaves using foam adhesives with the sentiment centre. That is all. I think I love the big bold flower makes a huge impact and I like that a lot 🙂 Hope you do too. 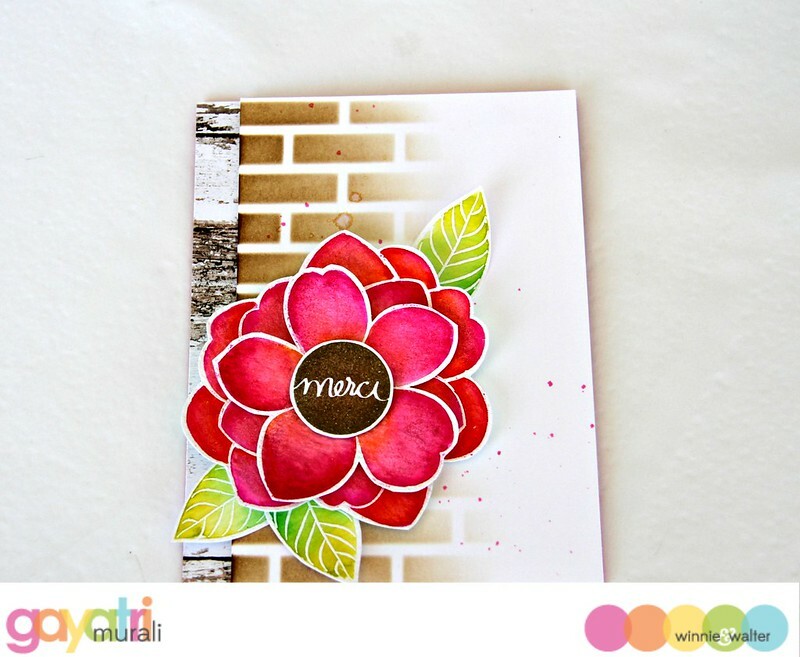 Check out Simon Says Stamp Blog and Winnie & Walter Blog for more inspirations using this awesome The Big Bloom stamp set. Comment on Simon Says Stamp Blog to enter to win a $50 gift voucher. Oh Gayatri! Splendid job done, so much to see in your work, just love this big and bold bloom set! 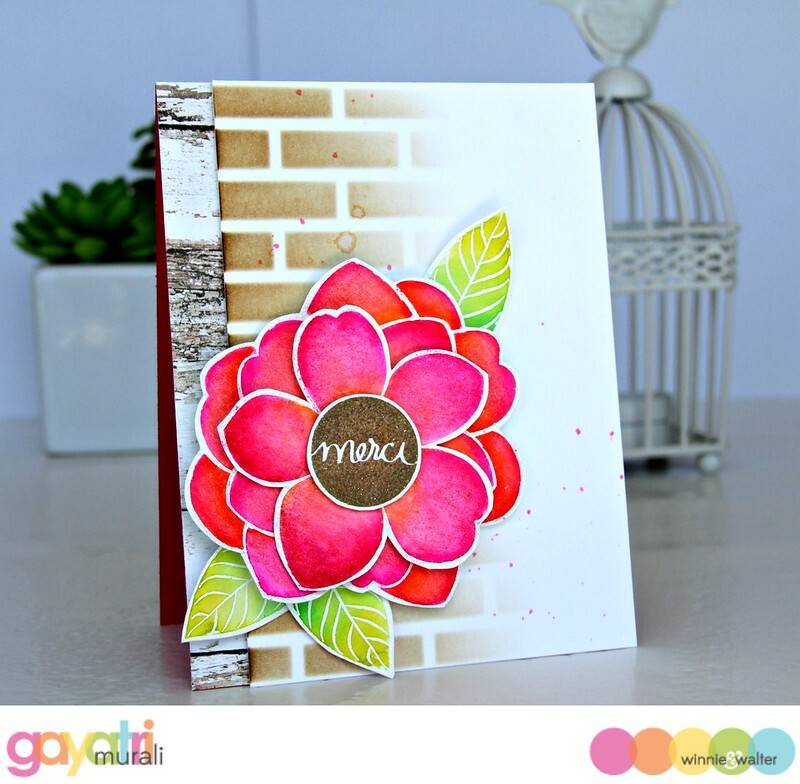 Your BIG BOLD flower is BEAUTIFUL, the colours and layers really make it POP – LOVE IT!!! LOVE your brick background too!!! stunning. I really like the result. I so am spending way too much at Simon's this September. W&W are the masters of creating BIG & BOLD. 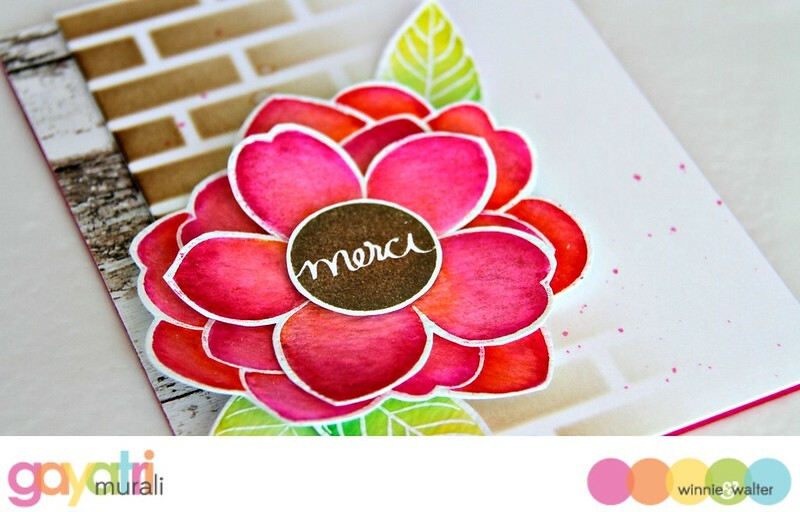 This single flower makes a huge impact on your card. It's lovely. Absolutely gorgeous! Love the composition of your card and the colours! So pretty! Love your flowers!! Wow!! Love the big flower!! Nice choice of color..
LOVELY brick background, really stands out! This is a beautiful card, I love this huge flower! Stunning card, as always. Your coloring techniques amaze me every time I saw it. Thanks for this beautiful card. I love your background is awesome!!! Wow! So bright and gorgeous!!! Love this!